Soldering is a process of joining two metals , glasses, wires or any other object by application of heat by flowing a filler metal (called as solder) to the joint. For small soldering needs such as joining connections in electronics applications, a soldering gun with small wattage does the job pretty well, however heavy duty applications need a soldering gun that has great power and provides firm grip during the job to the operator. 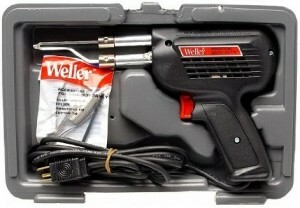 Weller understands this need and its D550PK soldering gun kit seems to address this need quite effectively. Unlike WEL8200PK universal soldering gun kit which has wattage of 100/140 watts, this soldering gun has a dual wattage of 260Watts/200Watts which delivers great power for soldering large metals. Weller D550PK has a pistol like design with a fingertip trigger provided for controlling dual heat settings. User can switch to 200 watt or 260 watt heat according to his need. The device provides a firm grip while the user is on the soldering job. Because of its heavy power , this soldering gun kit is mostly preferred to be used in industrial applications and wherever high efficiency soldering jobs are to be carried out. Curious what actual customers are saying about the Weller D550PK professional soldering gun kit? Click the link below to review the customer reviews on Amazon. Weller D550PK is a professional soldering kit and is a great choice if you are looking for a soldering gun that is strong, powerful and heats up rapidly. And about the brand Weller, there is no looking back. 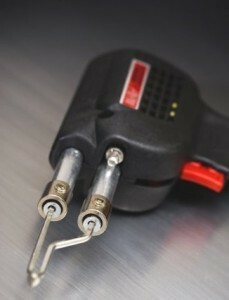 They have wealth of experience in producing quality power tools especially , the soldering gun / iron range of products.